When we begin Classical Conversations Cycle 3 in the fall, my littles will be ages 3, 6, 8, 10, and 11. This is our second time through this cycle and my oldest son’s last time. I’ve decided to create a book list all my own this year. (As opposed to previous years where I’ve layered over an AO list.) 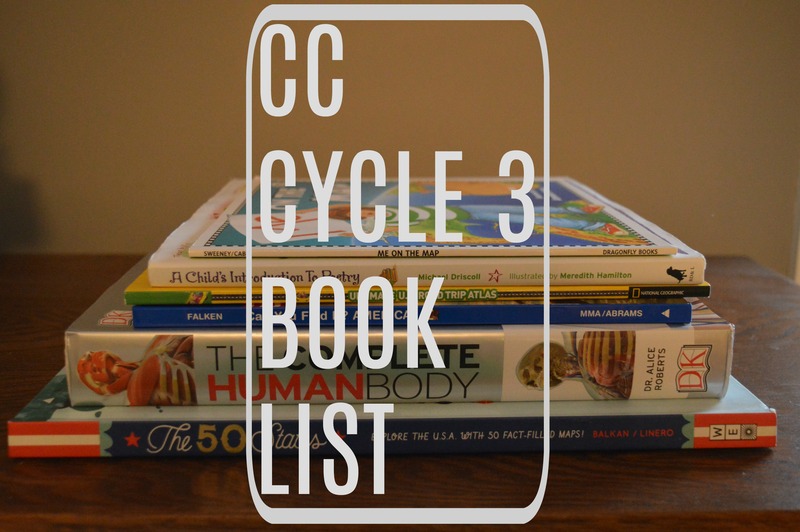 I have consulted my best “book buds” – Five in a Row, Ambleside Online, Sonlight, Honey for a Child’s Heart, and Give Your Child the World – and whittled my book list down to the ones I thought would be most intriguing to my children. With the wide age range we have, I’ve divided the books into some categories. But as we all know, age is just a number when it comes to truly good books. I hope you find some books here that appeal to your family! Owl Moon by Jane Yolen: Set in the farmlands of New England, a daughter and her father go owl hunting at night and encounter various animals on their search. Me on the Map by Joan Sweeney: A wonderful, simple introduction to understanding maps. I’d also like to check out Me and My Amazing Body. Make Way for Ducklings by Robert McCloskey: You might be able to find your own way around Boston after watching this duck family navigate their way on busy streets and around famous landmarks. The Erie Canal by Peter Spier: Spier’s storytelling illustrations animate the facts of canal town living. Down, Down the Mountain by Ellis Credle: Follow a brother and sister as they work to get themselves each a pair of shoes, while their parents insist that the mountain they live on provides all they need. Daniel’s Duck by Clyde Robert Bulla: Set in rural Tennessee during pioneer days, we see a young boy learn about woodcarving and giving to others. It’s a read aloud level 3, so after reading to my younger kiddos my older ones can read it independently too. Moonshot: The Flight of Apollo 11 by Brian Floca: A historical account and remarkable illustrations with all the magic a space flight is meant to evoke. All Those Secrets of the World by Jane Yolen: Big brothers know so much! Little Janie learns from her older brother, while their father is off to war and they’re living with their grandparents on the Chesapeake Bay. Miss Rumphius by Barbara Cooney: Along the coast of Maine, we find lupine flowers and a beautiful story of how they were planted. Blueberries for Sal and One Morning in Maine by Robert McCloskey bring you along for the coast town fun Sal has with her sweet family. It makes me want to plan a vacation to a quiet New England beach. Follow the Drinking Gourd by Jeannette Winter: A picture book introduction to the underground railroad. We’ll likely read it along with Sweet Clara and the Freedom Quilt by Deborah Hopkinson. 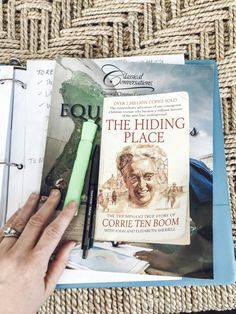 Both books provide brave, historical accounts of how slaves escaped – the first with the help of a white man and the second through the enterprise of slaves. When I Was Young in the Mountains by Cynthia Rylant: Join a little girl and her family to see what’s beloved about their life and home in the mountains. Climbing Kansas Mountains by George Shannon: Mountains in Kansas? Read this delightful tale of a father and his son to find out what they are. The Bee Tree by Patricia Polacco: The sweetness of a book must be chased after in the same way a bee tree is hunted for and so, they hunt all through the Michigan woods one day. The Finest Horse in Town by Jacqueline Briggs Martin: The silly tale and simple illustrations both portray early American village life with a sweet folksy spin. Warm as Wool by Scott Russell Sanders: I’ve gotten way more intentional about including women in our readalouds as my daughter has gotten older and I’m excited about this one. Based on the true story of the first pioneer to own sheep in Pioneer County, Ohio, Sanders gives a unique perspective on women of the frontier. Samuel Eaton’s Day: A Day in the Life of a Pilgrim Boy by Kate Waters: Following a young boy at an American settlement in 1627, we see what a typical day would be like for him. Photographs accompany the text. The Thanksgiving Story by Alice Dalgliesh: The Hopkins family travels in the Mayflower and celebrates with the Native Americans after a long journey and treacherous settlement. North American Indians by Douglas Gorsline: Beautiful illustrations and information on more than a dozen American Indian tribes. Sounds like it would make a great pair with The Very First Americans by Cara Ashrose. Native Americans are a diverse people group, and I think that’s great for our children to see. Locomotive by Brian Floca: The expansion of railroads across the U.S. forever changed the landscape of industry and travel. Catch the excitement with this book on their growth. Dumpling Soup by Jama Kim Rattigan: With this book, we visit Hawaii and explore some traditions found there. The Little Red Lighthouse and the Great Gray Bridge by Hildegarde H. Swift: Two New York landmarks are personified in this charming tale with an encouraging message. The Little Man in the Map: With Clues to Remember All 50 States by Andrew Mortonyi: An imaginative and rhyming tale with a class full of students and MIM to help create tricks for identifying all fifty states. I’m thinking this could also help me as I introduce the states to my class as a tutor. George Washington’s Breakfast by Jean Fritz: Answering the many questions of the boy, George Washington Allen, in the story and teaching readers lots in the process. Many other great titles for American History like Shhh! We’re Writing the Constitution. These are definitely wordier than the other picture books I’ve listed. For my youngest guys, I’d probably spread the reading out over a few days – maybe a week. The Long Way to a New Land by Joan Sandin: A story of immigration full of hardships and meant for the early reader (level 3). How great to have an important subject available to young children! There are a whole series of these books. I hope we can find them at our library. Sam the Minuteman by Nathaniel Benchley: Don’t so many young boys imagine themselves as great fighters? Mine certainly do! Well, they can put themselves in Sam’s shoes as he fights in the Battle of Lexington with his father. Chang’s Paper Pony by Eleanor Coerr: Journey with this family on the move with the masses as the Gold Rush of California begins and brings them all the way from China. Dust for Dinner by Ann Turner: The Great Depression and the dust bowl were parts of a difficult time in our nation’s history. This historical fiction tells the tale of how one family dealt with the challenges. Wagon Wheels by Barbara Brenner; For the three Muldie brothers, their time apart from Dad is a struggle to fend for themselves on the prairies of Kansas. Rip Van Winkle by Will Moses: In this beautifully illustrated folk tale, grandson of (cycle 3 artist) Grandma Moses, Will Moses retells Washington Irving’s beloved classic set in the Catskill Mountains with his own charming text and breathtaking illustrations. The Scrambled States of America by Deborah Short: Not just a funny tale of personified states swapping spots, but also fun facts and simple tricks for remembering each state. 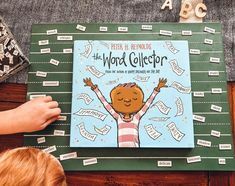 Martin’s Big Words: The Life of Dr. Martin Luther King Jr. by Doreen Rappaport: Picture book biography might be my new favorite category. Check out this one that highlights the spoken words of Dr. King. The Story of Ruby Bridges by Robert Cole: The true story from 1960 of six year old Ruby Bridges, the only student to enter an all-white New Orleans school after desegregation became law. It speaks of her courage and her faith as she attended school and asked God daily to forgive the protestors. For even more details and historic photographs, read Ruby Bridges Goes to School: My True Story by Ruby Bridges. Carry a Big Stick by George E. Grant: Ambleside Online taught us to explore biographies, and this one on President Roosevelt will be one of our choices for this year. I love reading about a famous person from history in the context of their lifetime. Abraham Lincoln’s World by Genevieve Foster: We read George Washington’s World this year and it was my boys’ favorite book. So, I think this book will be a great one for my family. If you’re looking for something to tie some strings of history together, these are a great series. Of Courage Undaunted by James Daugherty: The telling of Meriwether Lewis and William Clark’s exploration of the Midwestern United States using original accounts. Lewis and Clark traveled with a corp of explorers, which included various men from Native American tribes and the well-known female translator Sacajawea. Having North American Indians or The Very First Americans on hand to accompany this telling will certainly add to our understanding of Native Americans as we read. We the People: The Constitution of the United States by Lynne Cheney: Using quotes from the authors of the Constitution and the captivating illustrations of Greg Harlin along with a factual and fascinating story, we are invited in to the scene as delegates from the strong, but fragile new country gather in Philadelphia. Christmas in the Big House, Christmas in the Quarters by Patricia C. McKissack: Not to be confused with a holiday feel-good book, this is rather a well researched portrait of the stark differences between white owners and black slaves. Amazon lists it for ages 9-12, so I plan to preview it before any of my younger children listen in. The Watsons Go to Birmingham by Christopher Paul Curtis: Told through the eyes of forth grader, Kenny Watson, the Watson family travels to Alabama from Michigan to give their grandmother a chance to straighten out Kenny’s troublesome older brother Byron. But they enter Birmingham, Alabama, at an especially tragic time for the community. While the family is fictional, the history is accurate. This is definitely a family read for us, since there will be much my children are processing for the first time. Skippack School by Maugerite de Angeli: We’re very close to Skippack, PA, and have some personal connections there, so I’m extra interested in reading this book and learning more about our local history. The Disappearing Spoon: And Other True Tales of Madness, Love, and the History of the World from the Periodic Table of the Elements by Sam Kean: I need all the help I can get to make the study of the Periodic Table of Elements interesting. And this actually already has me interested! But, even better? There is a youth edition now for ages 10 and up. I’m undecided yet if I’ll get the adult one and “youth it down” or go straight youth edition. A Child’s Introduction to Poetry by Michael Driscoll: Poems printed in the book are read by professional actors and included on a CD. Poets such as Homer, Maya Angelou, and Elizabeth Barrett Browning and various kinds of poetry, such as sonnets, haikus, and nursery rhymes are part of the book. Toliver’s Secret by Esther Wood Barry: A child spy undercover in the Revolutionary War? I can already imagine my boys reading this historical fiction in one day’s time. Justin Morgan Had a Horse by Margeruite Henry: A great story that happens to include some American history – this horse is the first in what will become the world-famous American horses – the Morgan. Swift Rivers by Cornelia Miegs: A young man of Minnesota floats down the Mississippi in hopes of finding more for himself. Learn more about life on the river and lumber mills. The Journeyman by Elizabeth Yates: A journeyman painter passes through a small New Hampshire town and offers an new opportunity to a bit of an underdog. Pedro’s Journal: A Voyage with Christopher Columbus by Pam Conrad: Hired aboard to document the journey, Pedro captured so much excitement, as well as interesting details about the ship and the times with his drawings and words. Phoebe the Spy by Judith Griffin: Phoebe is hired as a housekeeper for George Washington, but she’s actually a spy. An intriguing and historically accurate peak into Revolutionary War times. Robert Fulton by Maugerite Henry: Part of the series of books on childhoods of famous Americans, this biography tells of Robert Fulton who grew up to be a famous craftsman. The Bears on Hemlock Mountain by Alice Dalgliesh: My kiddos are always fascinated by tales of children on independent adventures, so I think they will love this story of a young boy in Maine trekking across the mountain alone on a family errand. His parents say there are no bears, but are there? Sarah Whitcher’s Story by Elizabeth Yates: Wander into the New Hampshire forest with little lost Sarah as searchers from across the area try to find her. 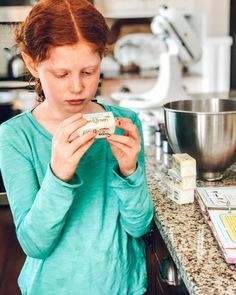 The Cabin Faced West by Jean Fritz: After moving with her family from Virginia to frontier life in Pennsylvania, young Ann isn’t sure what to think. Does an unexpected visit from George Washington change her feelings on their new life? A Picture Book of Amelia Earhart by David A. Adler: I’m so happy to have found a series of biographies made for young kids. This says it’s a 3rd grade reading level, and I’m thinking any of these would make great options for Essentials’ Faces of History papers later. Gentle Ben by Walt Morey: Off to Alaska for the tale of two friends, young Mark and Ben – an Alaskan Brown bear. We recently had a bear visit our backyard and one of my children desperately wanted to make him a friend, so I know the basis of this book will capture his attention. Always Inventing: A Photobiography of Alexander Graham Bell by Tom L. Matthews: A National Geographic children’s book with photos and drawings from Alexander Graham Bell’s life. I am such an inside the box thinker sometimes. I need a little extra help exposing my children to visionary thought. Sarah, Plain & Tall by Patricia MacLachlan: Can you imagine having your new stepmom only known to your father or you, because she responded to his ad in the paper for a wife and mother? Me neither! Sounds like this beloved first book in a series of five is a can’t miss tale of frontier family life and might best be enjoyed through the listening of the audiobook version narrated by Glenn Close. Winter Danger by William O. Steele: Eleven year old Caje experiences a range of emotions and adventures when due to circumstances beyond his control he switches from a vulnerable survivalist lifestyle to a comfortable farming life. Which will he prefer? The Lewis & Clark Expedition by Richard Neuberger: The story of two great American explorers as told for children by the landmark history series. I think this’ll make a great independent reader for my boys. The American Dream by Russell A Baker: Historical fiction with young characters, adventure, and time travel sounds right up the alley of my 10 and 11 year old boys. Looks like it’s the first in a series, so if they love it, we’ve found something we can stick with for a little bit. Nettie’s Trip South by Ann Turner: Written by “Nettie’s” great granddaughter based on historical journal entries, this book has us seeing slavery in the South through the eyes of a young Northern girl unacquainted with its harshness. With this book, we invite our children and ourselves to emotionally engage with history and not just study it as facts. 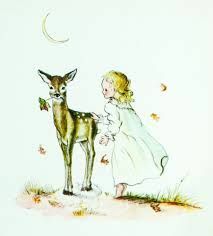 The Yearling by Patricia Reilly Giff: I know this book is beloved for its pet and child dynamic, but I’m most interested in its Florida backwoods setting and its longtime consideration as an example of great American literature. But, it is a biggie, and we might need to wait till my boys are a bit older. Sing Down the Moon by Scott O’Dell: The true, forced migration of Navahos from their homeland in Arizona to New Mexico as told by a young Indian girl. I’m Sorry, Almira Ann by Jane Kurtz: Two best friends travel the Oregon Trail with their families. One small accident leads to an injury, which changes them both. My Side of the Mountain by Jean Craighead George: A young boy adventures out on his own from crowded city life in New York City to an isolated life in the Catskill Mountains. All of a Kind Family by Sydney Taylor: The first in a series of five books with five sisters growing up in turn of the century New York with each other and not much else. I’m personally excited to also read about their Jewish faith. I suspect I’ll learn much about my own family’s heritage. Roller Skates by Ruth Sawyer: Newberry Medal winner set in the 1890s, wealthy 10 year old Lucinda explores the city on roller skates when her parents vacation in Italy one summer. it’s the beginning of many new adventures for her. Strawberry Girl by Louis Lenski: A little bit of Florida history with the story of a spirited girl and her family. The Cricket in Times Square by George Selden: Typical New York City tourist Chester starts in Times Square, but eventually tours around with new buddies Tucker and Harry. 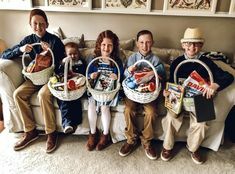 The Betsy-Tacy Treasury by Maud Hart Lovelace: We’ve actually read Betsy-Tacy, but we love the delightful stories so much that I wanted to share them with you anyhow. I think your heart will swell with Betsy when she finds a best friend in Tacy and you’ll enjoy following their sweet friendship in their small town in Minnesota. And in case you think these books are just for girls, my boys have enjoyed the first four books again and again. A Girl of the Limberlost by Gene Stratton-Porter: Elnora and her widowed mother live on the edge of the Limberlost Swamp in Indiana. Caddie Woodlawn by Carol Ryrie Brink: A brave girl with her pack of brothers sounds just like our home, so, of course, we should read it! And learn about growing up in the woods of Wisconsin in 1864. The Road to Home by Mary Jane Auch: Mem’s father stops to dig the Erie Canal in New York and without her mother, she knows she has to walk her younger brother and sister to the protection and care of her grandmother’s home in Connecticut. Shipwrecked by Rhoda Blumberg: The remarkable true tale of “the first Japanese person to set foot in the United States”. Fireworks, Picnics, and Flags: The Story of the Fourth of July Symbols by James Cross Giblin: Well, aren’t you curious? I am! Bright Freedom’s Song: A Story of the Underground Railroad by Gloria Houston: Bright’s experience with slavery comes when she assists her parents in their work to move slaves along the underground railroad. Based in North Carolina in the 1850s. Streams to the River, River to the Sea by Scott O’Dell and Sarah Bishop: Truthfully up in the air about this one. It’s a historical fiction based on a true character and while reading it would most likely be enjoyable, I’m concerned it could confuse fiction with fact for my littles. Freedom Train: The Story of Harriet Tubman by Dorothy Sterling: I remember reading this as a child and being in awe of Harriet’s strength and bravery. I hope it makes a permanent impression on my littles too. Minn of the Mississippi by Holling C. Holling: You can’t go wrong with any of the rich and detailed stories from Holling – Tree in the Trail, Paddle to the Sea, and more. Great stories with so many historic, scientific and geographic lessons. We’ve read them all, but they can’t be left off a list where American geography is concerned. I like having reference books that pertain to our current subject matter around. I’m impressed by how often my littles pick them up to read and how much they learn from this buffet of books. Landmark History by Ruth and Daniel Boorstin: Early American history is covered in this reference book with timelines, maps, and full-color illustrations. This is volume one of two. The second volume continues with American history till the late twentieth century. Our 50 States: A Family Adventure Across America by Lynne Cheney: Fun to travel along with Annie, Ben, and family as they find interesting, historical, and quirky sights all through the country. The 50 States: Explore the U.S.A. with 50 Fact Filled Maps by Gabrielle Balkan: Each states gets a large, colorful two page spread with key facts, famous locals, moments to remember, and more. A is for Abigail: An Almanac of Amazing American Women by Lynne Cheney: As Abigail Adams famously advised her husband, “Remember the ladies”. This book not only reminds you of the ladies, but teaches you about ones you’ve never heard of before, but should’ve. Ultimate U.S. Road Trip Atlas by National Geographic: Whichever of my kiddos grabs this first is likely to read a few pages at a time, and quiz the rest of us with their newfound knowledge. It’s going to be perfect for our next road trip. Draw the USA by Kristin J. Draeger: Simple, easy to remember steps to drawing the USA with the goal of eventually drawing all fifty states from memory. Perfect fit for CC! The Complete Human Body: The Definitive Visual Guide by Dr. Alice Roberts for DK: Just under 500 pages before the glossary, this guide is large and full of detailed, computer-generated illustrations with an overview of the body, anatomy, and body functions. Please note it is not from a Christian standpoint and may contain a few things you disagree with, including four pages explaining “human evolution”. I found the amount of things limited and manageable for our use. Friends, that’s a lot of books. There are just so many good ones! As far as independent readers go, we will check our local library and shop our local used bookstore (if you’re local, check out Twice Upon a Time Books in Hatfield, PA) before buying many new. Our list will likely be made smaller just by what I can find available. I will also purchase new or used copies on Amazon, as we have need. For reference books, I typically buy new due to the amount of use they get. And finally for our read-alouds, I often buy the kindle version since they can cost less and it’s easy for me to grab the kindle to read a few different books in one sitting. Great list! We read An American Dream by Russell Baker. It was excellent! You’re going to love it, it’s a great family read aloud! Thank you so much for compiling this list! Do you purchase most of your books for the year, or do you check them out from the library? Thank you, Gwen! I typically buy my read-alouds and the books I use for my youngest ones, because we read them over & over. Also, my library doesn’t tend to have them. For my middle-ish age ones, I buy some readers secondhand, but also check out from library. My library tends to have lots of those on the shelves. With my older guys, if I think it’s a book they’ll love and want to read again and again or if the younger ones will read after them, I buy. Have you lined these up with cycle 3 weeks? If so, do you have a working list? Have you done other cycles?